Earlier this week I gave a short talk as part of NISO’s Virtual Conference on Web Scale Discovery. They asked me to speak about the User Experience of discovery systems, and I decided to focus on something that I’ve been obsessed with over the past few years: user journeys. Specifically, I was interested in the feelings our patrons often experience when doing library research. Last month at the Midwest UX Conference I heard Seth Starner of Amway talk about the experience many customers go through using physical spaces that are not designed with them in mind. His talk pulled out Joseph Campbell’s work on myth, equating the difficult experiences we make for customers to the Hero’s Journey, and I realized that this difficulty is applicable online as well, especially in libraries. Here is a video of the talk, followed by an approximate writeup of my notes as I went through the presentation. King Minos had a problem. His wife had given birth to a minotaur, a creature with a human body but e head of a bull that was hungry for human flesh. He had a huge labyrinth built to contain the creature so that he wouldn’t get out an eat the King’s subjects. Conveniently, King Minos found a steady food source in the upstart city of Athens, just across the Mediterranean. Each year 14 Athenean youths, 7 men and 7 women, were sent to Crete as tribute to become minotaur food. Theseus, the son of the Athenean King, decided to put an end to the minotaur, and so he set sail with the otheryouths to Crete. King Minos’ daughter, Ariadne, to a shine to Theseus and gave him a sword and a string that he could use to find his way out of the labyrinth. So in he went. He wandered around in confusion for a while until he faced his great challenge: the minotaur. Theseus managed to kill the beast and follow the string out to the labyrinth’s entrance, and he sailed for home a hero. Joseph Campbell, in his book The Hero with a Thousand Faces, notes what he calls the “monomyth” that makes up the structure not only of this story about Theseus, but of most myths, legends, and religious narratives. 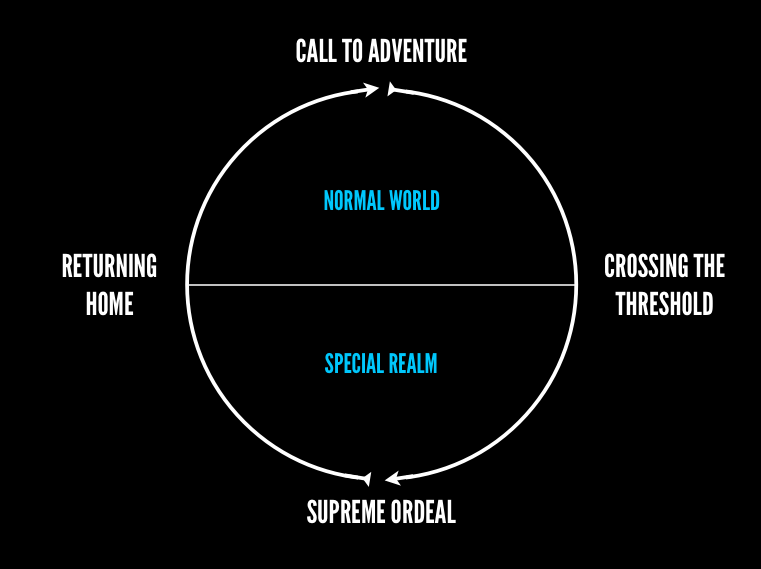 Campbell’s structure of the monomyth, or “hero’s journey,” helps us not only understand the narrative structure of myth, he says, but also how we understand big challenges we face in our own lives. Now, let me tell you another story. The Professor, we’ll call him Professor Minos, posted an assignment. Each of the fourteen undergraduates in his ancient history class must write a research paper on a topic of his or her choosing. Ted, a sophomore, heard that Professor Minos gave this assignment every year, and he didn’t want to repeat the class. He decided to write the research paper, but first, he needed to do some research. 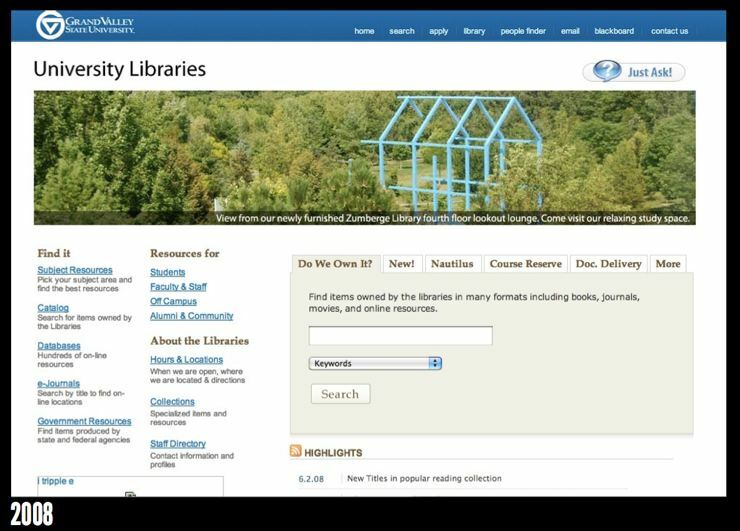 He entered the Library’s online Database A-Z list and wandered around in confusion for a while, until he faced his biggest challenge: the default advanced search screen in Academic Search Premier. With help from a kind librarian, Ted managed to find a few relevant full-text articles and went on to write his paper. As for whether he was hailed a hero, we’ll have to wait for Professor Minos to grade the papers. This story shares a structure with the tale of Theseus, but it also contains Campbell’s monomyth. If you talk to some of your patrons, you’ll find that it is surprisingly common for folks to experience library tools like Minos’s labyrinth. They leave the normal world for the special realm of library research, crossing the threshold between worlds at the darkened door of the Database A-Z list. After suffering through the supreme ordeal of looking for relevant items in this or that database, the strongest might emerge with full-text in hand. 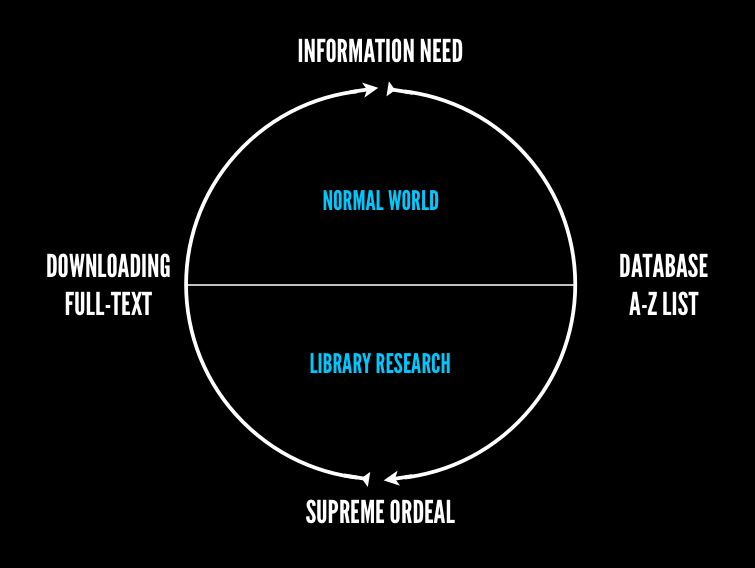 This isn’t just hyperbole, this is how many people experience using our tools for research. It’s unfamiliar, and so the metaphor of the monomyth helps them make sense of their struggle. Want a book? 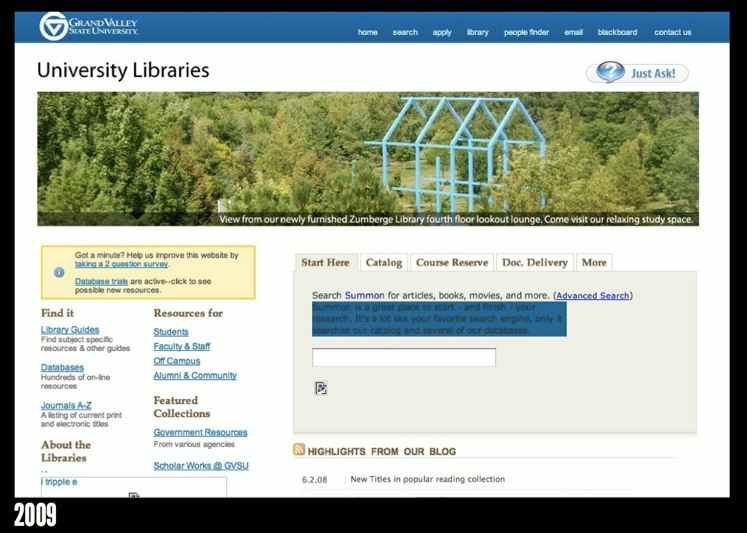 Try the “University Libraries Catalog” or “WorldCat” or “Other Library Catalogs,” whatever those are. Want a book chapter? Should you look under articles or books? And since everything has “More,” more of what? Our patrons had to know what specific tool they needed to use before they could begin. That’s something that many of us went to Library School to learn! A few years later we hopped on the tabbed search bandwagon, because it seemed like we could fool our patrons into thinking that search was easier if they could only see one search box at a time. In 2009 we became the first customer of Serials Solutions new web scale discovery tool Summon. True to our form, we treated it like any other tool (with equally suspicious labeling). Now, instead of facing the beast Nautilus, folks would “Start here.” We didn’t give them any idea where they might end up, of course. Our patrons still had to know beforehand the right tool for the job, something novice researchers have a hard time with. The big problem was that we were putting our tools out to our patrons the way we thought about them. Our organizational charts were shaping our library user interfaces. By forcing our patrons to wander through a list of specialized tools organized by silo, we were making their search experience difficult. Usually they would wander around in confusion for a while, and if they were lucky, someone would hand them a sword or a piece of string so they could find their way through. We sent everyone from the search of the normal world, to a confusing special realm where the rules of search didn’t apply. We took something that people did every day and made it unfamiliar. But we kept coming back to the same question: how do we make this easier? This wasn’t just about slimming the site down and getting rid of links (although that helped). This was an issue of familiarity, about making the search experience perform the way our patrons expect. There is something to be said for simplifying, but simplicity isn’t our end goal. Familiarity is. So we started thinking about how to make this process—not just a screen or one part of the search, but the whole process—more familiar. 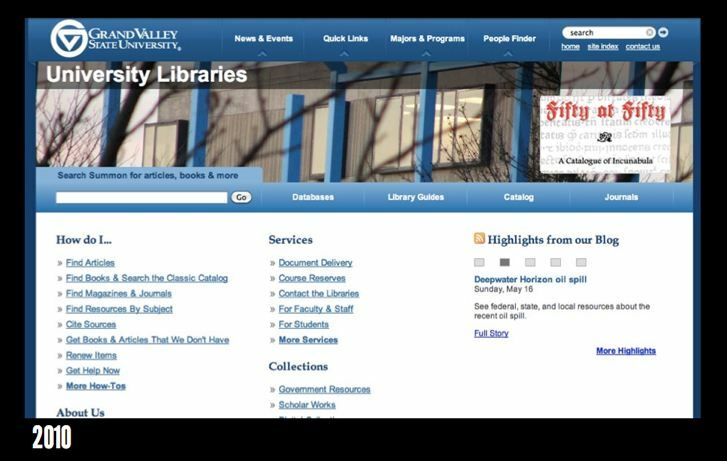 So in 2010 GVSU ditched the tabbed search and went with a single search box. The goal here was not just a single search box, but a single search process that would go from initial search to having results in-hand regardless of how difficult the search was. What we wanted, it seems, was one search to rule them all. We forget that most of our patrons don’t come to us to find things because they want to find things. Their research is always part of a larger story: answering a question, writing a paper or a book, cooking a meal, buying a house. Too often librarians get excited about all of the tools we have to help people, and we end up hijacking their stories and making them about the library. We bring everyone into our special realm out of a genuine desire to help. 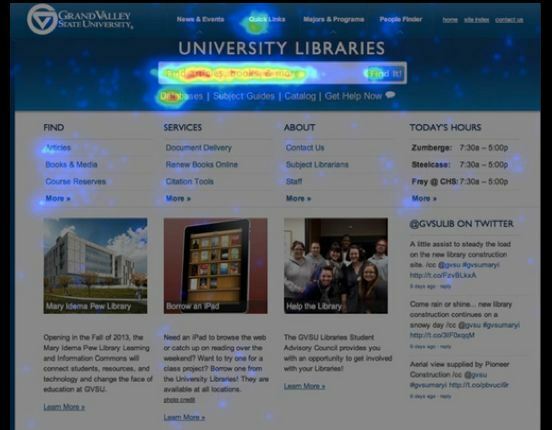 Web scale discovery isn’t perfect, of course, but it’s an effective way to help patrons feel more comfortable and to keep the focus on what they really need to do. It’s a way to keep their stories on track, in their own world, and to keep the beasts at bay for a little longer.